Feeling a bit overwhelmed by the thought of a commercial real estate appraisal? The process can be daunting, especially if you’ve never engaged in an appraisal before. After all, it is a detailed activity that can look different depending on the scope and nature of your property. To simplify and demystify the appraisal process for you, we have addressed ten of the most important questions asked. So, take a deep breath, read on, and be prepared to gain a deeper insight into this important real estate topic. We believe that you’ll feel better informed, more confident, and maybe even a little enthusiastic when it is time for you to schedule an appointment with a property appraiser. 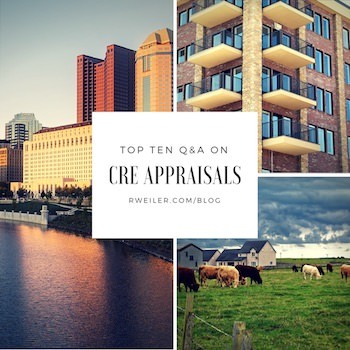 Question 1: What is a commercial real estate appraisal? Question 2: Who conducts a commercial real estate appraisal? A professional real estate appraiser carries out this process. Think of this person as a property detective; the appraiser assembles various facts, statistics, and other information regarding the property. The data is then analyzed and used to develop opinions of value. A good real estate appraiser possesses sharp analytical skills, sound judgment, and strong communication. Depending on the types of commercial appraisals they are working on, an appraiser may need to pass a test and become state-licensed or certified. Some go one step further and fulfill strenuous education and experience requirements to become designated members of the Appraisal Institute. All real estate appraisers must follow a very strict code of ethics and rules. Question 3: Why do you need a commercial real estate appraisal? Advising zoning boards, courts, and planners regarding the probable effects of proposed actions. Question 4: What is the overall commercial real estate appraisal process? The process details vary significantly depending on the nature of the project; however, the basic structure of the approach remains roughly the same across the board. First and foremost, much like a science experiment, the “problem” is identified. This may include determining the intended use, relevant characteristics of the property, and assignment conditions. Second, the scope of work necessary to solve the problem is planned out. The scope includes the amount and type of information to be researched and the analyses to be applied in an assignment. Third, relevant data is collected, verified, and analyzed. This may include market area data (general characteristics of the area/neighborhood) and comparable property data (sales, listings, offerings, vacancies, etc.). The analysis also takes into account four factors: scarcity, desire, utility, and effective purchasing power. Finally, after following these steps and principles, the appraiser forms an opinion of value and creates an appraisal report. In general, the full cycle of the commercial real estate appraisal process can take several days to weeks, when you factor in the inspection and subsequent investigative work. Fees can vary based on the size of your property, as well as the scope and nature of the appraisal. Question 5: What are the specific types of commercial appraisals? A property’s value can be determined in a variety of ways; however, each method is built on a foundation of data. That data may include details on the specific property or general information on the neighborhood, community, city, and/or region. There are three main types of approaches used when appraising commercial real estate: the cost approach, sales comparison/market approach, and income capitalization approach. Cost approach: Essentially, this technique equates the property value to the cost of constructing a replica. The cost approach also considers depreciation, thus, assuming a fair market value for the commercial property. Obviously, this appraisal method comes with its share of debate. For instance, how can you assume a similar site to build upon? And, can you really expect equivalent costs for rebuilding the property? Due to these questions (among others), the cost approach is often used to appraise new properties and unique properties with few comparable sales. Sales comparison/market approach: This method speculates that an investor will pay only what similar properties have sold for. As such, the sales comparison/market approach is rooted in which property features are alike and the costs associated with those features. Important characteristics may include location, size, condition, floor plan, and the surrounding area. Many in the commercial real estate appraisal industry believe this is a more accurate approach because the current market value is taken into account. Income capitalization approach: This tactic involves a rationalization of the income that a property may generate over time. Appraisers commonly use this method for properties such as shopping centers, office buildings, and large apartment buildings, which have a strong earning ability. When this approach is used for a rental property, an investor considers the net income generated, and other factors, to calculate its value on the current market, if sold. In addition, a lender will closely examine the findings and determine whether they feel confident that their investment will be repaid. To determine a final estimate, the property appraiser will consider the value that results from one of these three types of commercial appraisals. They will take into consideration the applicability/reliability of their preferred approach, relative to the kind of property being appraised, the adequacy of the data processed, and the overall purpose of the commercial real estate appraisal. The approach or approaches that are found to be the most reliable and applicable will bear more weight in determining the final estimate. Question 6: What are the different types of commercial appraisal reports? Your commercial appraisal report may cover a variety of important factors. These factors may include a comparative analysis of other properties in the area, a description of the property, an estimate of the value of the property, and a listing of any potential risks you may encounter. It may also include negative aspects that can impact the market value of the property. Depending on the needs and requirements of the client and project, the written commercial appraisal report will vary in type, format, length, and content. There are three possible written formats, as determined by the Uniform Standards of Professional Appraisal Practice. They are self-contained reports, summary reports, and restricted-use reports. Self-contained reports: This type of report fully describes the data and analyses used in the appraisal. It details a broad range of appropriate information within the actual report, with minimal references to files outside the report. Summary report: As its name suggests, this type of report summarizes the data and analyses used in the assignment. Additional data and/or analyses can be found in a separate file outside of the report. Any intended user can utilize this type of report. Restricted-use report: This type of report only states the conclusions of the appraisal. All data and/or analyses can be found in a separate file outside of the report. This is the shortest and least expensive type of appraisal report and can only be used by the client. If a written report isn’t necessary, a verbal opinion of value may instead be communicated after a preliminary analysis is conducted. Depending on your intended use of the report, your real estate appraiser can help you determine which type of commercial appraisal report makes the most sense for you. Question 7: Who can see the results of the commercial appraisal report? Rest assured; appraisers must maintain client confidentiality and cannot release the results of a report to outside parties without your permission. When you are scheduling the appraisal, you should go over who you want to use the report at its completion. For instance, you may want to share the appraisal with the seller, your lender, and perhaps your local property tax appeal board. These people or parties will be identified in the commercial appraisal report as the only ones authorized to use the report. Question 8: What are some overlooked aspects of the commercial real estate appraisal I should discuss with my appraiser? One important aspect that is often minimized or passed over is the date selection; make sure the appraisal is dated according to your needs. Property can be appraised as of the actual date of the inspection, as of a past date (referred to as a retrospective appraisal), or as of a future date (referred to as a prospective appraisal). Talk to your real estate appraiser to decide which date makes the most sense in your case. In addition to the date of the appraisal, it is critical that you perform your own review of the appraisal; double-check the real estate appraisal information to ensure that your appraiser considered every important factor. For instance, did they properly account for all the rooms in the property and its unique features? Did they cover all upgrades you made to the property? Don’t be afraid to confirm any part of your commercial real estate appraisal. Speak up to make sure the bottom line is precise. On the flip side, you should never misrepresent facts; appraisers are expert inspectors and researchers, who work tirelessly to discover the true value of your property. Additionally, you shouldn’t withhold anything if your appraiser asks for information. This might include drawings or blueprints of the property, a tax bill for the property, or income statements. It is in your best interest to provide all the materials you can; doing so will enable your real estate appraiser to do the best and most accurate job possible. Question 9: Is there anything else I should keep in mind? Always remember that commercial property appraisals are estimates of value based on limited information (e.g., a property appraiser will not verify the boundaries of a property; this will need to be done by a surveyor). Of this limited information, some is based on secondhand data. For instance, the property appraisers do not perform a walk-through of comparable properties; instead, they base their comparisons on recorded sale prices and the descriptions of the properties. Therefore, any unrecorded details that may affect your property value will not be considered. Also, recorded prices of comparable properties in similar regions may differ based on the owners’ negotiation skills in buying and selling property. Something to keep in mind is that when analyzing comparable properties, only the market value of the differences are considered, not their actual cost. So a proper real estate appraisal will also depend on accurately assessing the market value of the differences between the appraised property and similar properties. As you can see, there are many sources of possible inaccuracies when conducting a commercial real estate appraisal. As a result, the appraiser may offer you a range of possible values for the property; not just one number that is set in stone. Question 10: Where can I find highly qualified appraisers I can trust? If you are looking for a commercial appraisal management company in Columbus, Ohio, you will be very satisfied with The Robert Weiler Company. We have a long history of assisting a diverse portfolio of CRE investors and property owners throughout the state of Ohio. Our commercial appraisal management team takes the time to provide one-on-one attention to every client. They also bring an unmatched skill set to the table, ensuring a complete, fair, and accurate job you can feel confident in. In need of our appraisal services? Speak with one of our experts today by calling our offices at 614-221-4286. You and your team will be glad you spoke with one of the seasoned commercial real estate appraisal professionals at The Robert Weiler Company.